The bestselling author answers our readers' questions about business, leadership - and mountain climbing. (Fortune Magazine) -- Perhaps the most influential management thinker alive today, Jim Collins, 49, has taught millions of readers to embrace Big Hairy Audacious Goals and to search for their Hedgehog Concept. A self-described "entrepreneurial professor," Collins - author of "Built to Last" and "Good to Great" - took time out from his research to take questions from Fortune's readers in the first in an occasional series. 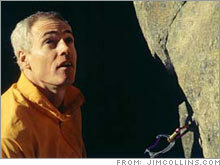 In addition to writing bestselling mangement books, Collins is also an avid mountain climber. Now's your chance to ask Stewart about launching your own company, how the market turmoil has impacted her empire, and what�s next for the titan of homemaking? First, don't obsess on finding the "great idea." In fact, our research shows a somewhat negative correlation between pioneering a great idea and building a great company. Many of the greatest started with either no great idea or even failed ideas. Sony (Charts) started with a failed rice cooker. Marriott (Charts) started as a single root beer stand. Bill Hewlett and Dave Packard's great idea was simply to work together - two best friends who trusted each other - while their first four products failed to get the company out of the garage. They followed the "first who" approach to entrepreneurship: First figure out your partners, then figure out what ideas to pursue. The most important thing isn't the market you target, the product you develop or the financing, but the founding team. Starting a company is like scaling an unclimbed face - you don't know what the mountain will throw at you, so you must pick the right partners, who share your values, on whom you can depend, and who can adapt. "Good to Great" looked at companies with long track records. How do the ideas in the book apply to disruptive startup companies, like YouTube or Google (Charts)? --George Kim, Washington, D.C.
My colleague Morten Hansen and I are nearing completion of six years of research studying companies that went from startup to greatness in environments characterized by turbulent disruption. We've deliberately selected entrepreneurial companies in the most severely disruptive industries, using the following analogy: If you wake up in the security of base camp and a storm moves in, you'll probably be fine. But if you find yourself at 27,000 feet on the side of Mount Everest, where the storms are faster moving and unpredictable, a storm just might kill you. Most leaders today feel they are moving higher on the mountain, whether in Google's world or traditional industries, and we want to know, Why do some prevail from vulnerability to greatness in the face of turbulent disruption, while others don't? Most founders fail to become effective managers after the companies they started become too large for them to control. However, a few, such as Bill Gates, managed to grow into top-tier CEOs. What are the distinguishing factors between the transformed entrepreneurs and others? --Haimu Sun, Evanston, Ill. It's simply a myth that entrepreneurs can't evolve into company builders. Our research shows quite the opposite: In great companies the entrepreneurs generally grow as the company grows. Here is a short list of those who evolved into company builders: Henry Ford, Sam Walton, Hewlett and Packard, J.W. Marriott, Sony's Akio Morita, Walt Disney, Intel's Robert Noyce and Gordon Moore, Southwest Airlines' Herb Kelleher, and of course Gates and Phil Knight. They made the shift from time telling to clock building - to seeing their primary creation as the company itself: what it stands for, its culture and how it operates. Willful humility. The best CEOs in our research display tremendous ambition for their company combined with the stoic will to do whatever it takes, no matter how brutal (within the bounds of the company's core values), to make the company great. Yet at the same time they display a remarkable humility about themselves, ascribing much of their own success to luck, discipline and preparation rather than personal genius. Do you find that the leaders of great companies are less likely to be paid excessively, but more consistently with the others in their organization? --Bill Maltarich, Bonita Springs, Fla.
Our research found no correlation between executive compensation and shareholder returns. Excessive executive pay tends to lead to one thing: even more excessive pay, not increased shareholder value. I haven't yet decided on my next book. I've got the two big research questions in late stages: "great to good," which I'm writing up now, and the turbulent-disruption research. One of those might become a book, but my first focus is to make sure we successfully answer the questions we set out to answer. My all-time favorite is Yosemite Valley in California. When you're hanging from an anchor, perched in the middle of a giant rock face high above the valley floor, it's like being in a vertical ocean of granite - incredible! The quest for greatness that you've studied fits well in America's tradition of success-absorbed self-improvement wisdom ranging from Benjamin Franklin to Stephen Covey. Do you think we should also focus on the wisdom from failure? Thanks, Jeff. I appreciate the question, because it gives me a chance to correct a common misinterpretation of our work. Our research is not based on studying success. We study the contrast between highly successful and less successful outcomes. We put as much weight on those that failed to achieve (or sustain) great results as on those that did, asking the question "What principles explain the difference between the successes and the failures?" We'll be releasing the results of a new piece of research that examines the inverse of "good to great" - namely, "great to good": Why do some great companies fall and not others? Questions for Donald Trump: What's next for The Donald? Ask him yourself. Fortune editors will take your questions to Donald Trump and get you answers. Submit a question.